The world famous publication, Harper's Bazaar magazine, has been a fashion authority for well over a century. 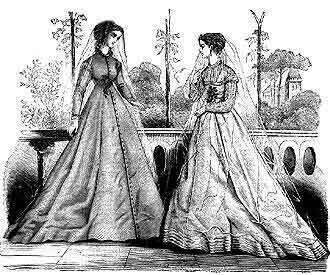 Discover an elegant Victorian styl wedding dress from the past for inspiration in planning your own special bridal gown today. Wedding gowns are a timeless fashion statement featuring fine fabrics, lavish embroideries, delicate lace and ornate beading. Whatever the era, wedding dress couture highlights elegance and femininity. Harper's Bazaar published its first issue in 1867 in the large newspaper format design of Harper's Weekly. Harper’s Bazaar, based in New York, was intended for the women of the middle and upper socio-economic classes of society, and provided designer fashions and couture direct from Paris. The focus of Harper's Bazaar was on "....the useful with the beautiful, and aiming to include every thing that will be interesting to the family circle.... Being intended largely for ladies, it will devote a considerable space to the matters which fall particularly under their jurisdiction, such as dress and household affairs." [Harper's Bazaar, November 2, 1867] In 1901, Harper's Bazaar became a monthly, and in 1929 its title was changed to Harper's Bazaar, a magazine still in publication today. 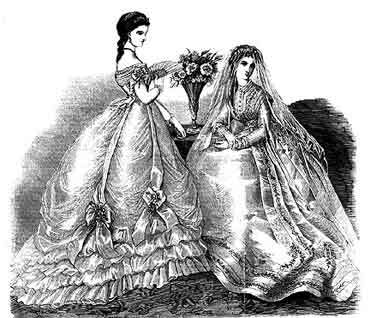 Featured here are two Victorian style wedding dresses, referred to as "Bridal Toilettes" from the November 2, 1867 issue of Harpers Bazaar. Figure to the left is a gored dress of white persane, fastened up the front with ornate crystal beads. The high neckline is trimmed with Valenciennes lace, as are likewise the caps of the sleeves. A tulle veil and wreath of orange blossoms accent the ensemble. 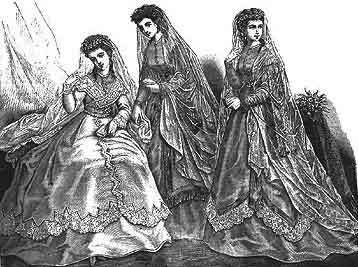 The bride on the right wears a princess dress of white mull, worn over a high-necked waist of Valenciennes lace and insertion. The skirt is tucked; the waist trimmed with bias folds of the same stuff. 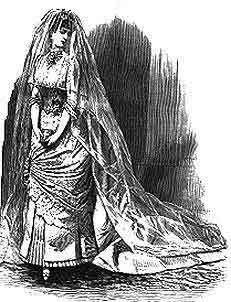 The bride also wears a tulle veil and wreath of orange blossoms.In the 18th and 19th centuries brides wore many colors on their wedding day. 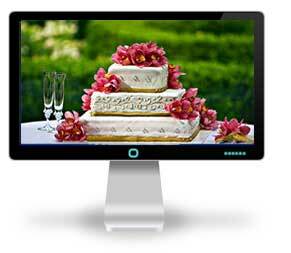 It was not until the 20th century that white became the traditional color of wedding dresses. 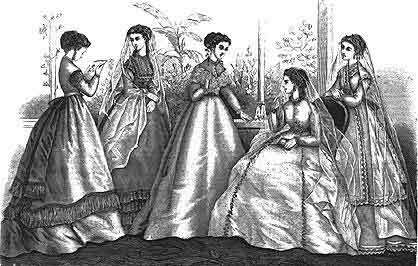 A young woman’s Victorian wedding dress was a treasured keepsake often packed away in a trunk or chest and preserved within the family for generations. Because these wedding dresses were seldom worn more than once, many ofthese creations of lace and satin can be found in near perfect condition in the costume collections of museums.